29 August 2018When is the best time to eat a salad? Before, during or after a meal? Have you ever wondered when is the best time to eat salad? Should it be before a meal, with a meal or after a meal? While traveling in Europe this summer, I realized that the timing of when salads are eaten varies by country. In the United States, it is traditional to serve a salad before the main course. In Italy, it is common to eat the lettuce salad after the main course. We were pleasantly surprised in the Netherlands to be served one large family sized salad at restaurants during the meal, even though we had not ordered one and were additionally not charged for it. When is the best time to eat a salad or does it even matter? Shall I eat like an American and eat my salad before the first course? 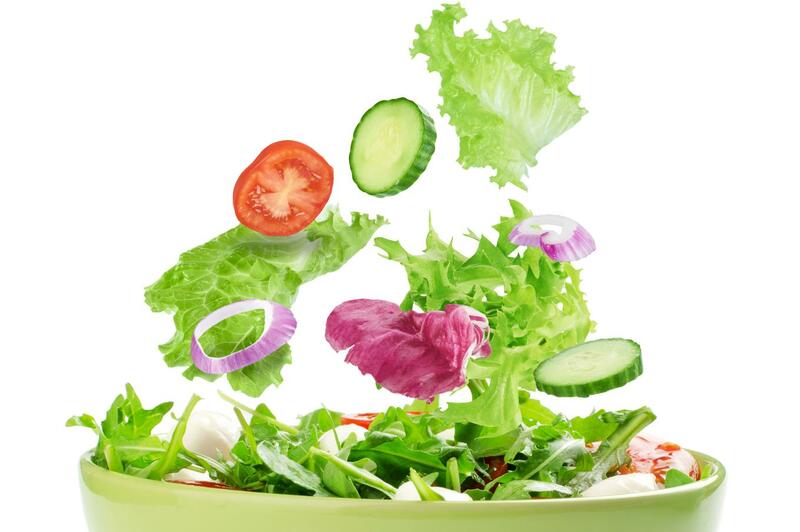 A research study in 2012 demonstrated that eating a salad before the meal increases one's vegetable consumption by 23%. Especially since only one out of ten adults eat enough fruits and vegetables each day, consuming your salad upfront would be an easy way to eat at least 1 1/2 - 2 cups of fruit each day and 2 - 3 cups of vegetables each day. Fiber: Fiber can help lower cholesterol, is good for digestion and prevents constipation. Weight loss: Foods high in fiber can you make you feel fuller longer and thus eat less. If you are trying to lose weight, eating a salad first (limit to 150 calories or less) can boost the feeling of fullness and thus reduce the total number of calories eaten during the meal. If you are a Mom or Dad and want to make sure your children are consuming a plentiful natural dose of vitamins and minerals, serve the vegetables up front when your children are really hungry. I remember not only eating a fresh lettuce salad while waiting for my mom to finish cooking the rest of supper but also eating frozen peas with a toothpick! Shall I eat like a person from the Netherlands and eat the salad with the meal? Building a healthy plate, by filling half of the plate with vegetables and fruits, follows the USDA MyPlate Food Guide for balanced eating. In addition, it is quick and easy for fast evening meals. Shall I eat like an Italian and eat my salad after main course? There are two reasons why Italians eat salad after the main course. The dressing in Italy is generally made with extra virgin olive oil, balsamic vinegar or wine vinegar and salt and pepper. Because often the main course is accompanied by a wine, Italians do not want the acidity of the vinegar to compete with the acidity of the wine. Secondly, the acidity of the vinegar is supposed to rejuvenate the taste buds in anticipation of dessert. Thus, salad is eaten after the main course. Given these three scenarios, one can see there are good reasons for all three possibilities. Thus, the bottom line is: Eat a salad every day at whatever time is most convenient for you. Now that fall is here, and your life probably has more of a routine, eating a salad almost every day is one of the simplest healthy eating habits you can adopt and make part of your routine. At a restaurant, you can order a side salad. Of course, if weight loss is your goal, limit toppings such as croutons, large of amounts of cheese and creamy dressings. Note: 3 cups of spinach have 21 calories and less than 1/2 gram of fat while 2 tablespoons of ranch dressing contain 110 calories and 11 grams of fat. It's not the vegetables, it's the dressings that are high in salt and unhealthy fats. At home, you can buy pre-washed lettuce, slice up some vegetables (go for at least 3 colors!) and sprinkle with some light salad dressing. Lately, I have been adding finely chopped fresh herbs, such as parsley, cilantro, chives, and basil. I have also decreased the amount of dressing I use, or I only sprinkle balsamic vinegar over the salad. Salads are fun to eat with a lot of colors, textures, and flavors. Eat a rainbow of colors either before, during, or after a meal, and adopt a new habit today. When It Comes To Diet, Resolve to "Do", Not to "Don't"
Healthy Eating on a Budget: Is It Possible?